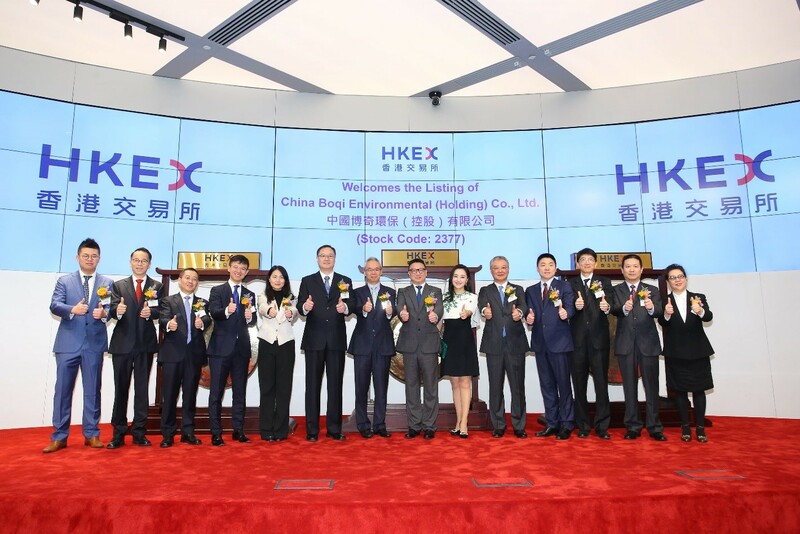 [16 March 2018, Hong Kong] China Boqi Environmental (Holding) Co., Ltd. (“Boqi Environmental” or the “Company”, together with its subsidiaries, the “Group”, stock code: 2377), a market leader among independent flue gas treatment integrated services providers in China, was successfully listed and commenced trading on the Main Board of The Stock Exchange of Hong Kong Limited (“SEHK”) at 9:30am today, under the stock code 2377 with a board lot of 1000 shares. CMB International Capital Limited is the Sole Sponsor, the Joint Global Coordinators and the Joint Bookrunners. Fortune (HK) Securities Limited and AMTD Global Markets Limited are the Joint Global Coordinators and the Joint Bookrunners. ABCI Capital Limited, BOCOM International Securities Limited, China Renaissance Securities (Hong Kong) Limited, Haitong International Securities Company Limited, Huatai Financial Holdings (Hong Kong) Limited and Zhongtai International Securities Limited are the Joint Bookrunners. About China Boqi Environmental Holding Co., Ltd.
China Boqi Environmental Holding Co., Ltd. is a market leader among independent flue gas treatment integrated services providers in China, namely private integrated environment protection companies providing flue gas treatment services not controlled by any power group. According to the report from China Electricity Council and Frost & Sullivan, in terms of cumulative installed capacity in operation by the end of 2016, Boqi Environmental was ranked No.1 Independent flue gas desulfurization EPC service provider and No.2 Flue gas desulfurization EPC service provider in China., and has been gradually expanding into other environmental protection and energy saving areas as well as committed to become a world-class environmental industrial group. Boqi Environmental commenced its flue gas treatment business since 2003 which are among the first independent participants in the flue gas treatment industry in China. Services provided by Boqi Environmental cover the whole-industry-chain of the flue gas treatment industry, from project designing, equipment procurement and facilities construction to operation and maintenance and concession operation of flue gas treatment facilities. Boqi Environmentals’ projects have a broad geographic coverage, covering almost 30 provinces, municipalities and autonomous regions in China. Meanwhile, its business has also been expanding to Europe, South Asia, Latin America, Africa and Southeast Asia.